If you are beginning your sock with ribbing, this makes a good stretchy edge and eliminates the use of the co comb. Wires that are handy size for the knitting needle cast on or turning your work can be found in hobby stores in 3 foot lengths, you may sandpaper or grind the ends to a smooth point, or even cut them in two for more convenient lengths.There are also extra long double pointed needles that you can use for this.I have recently begun using heavy weed-eater cord for this job, I like it because it is flexible, and you can take projects off onto the cord and put them away handily, in case of an interruption or emergency need for the bed for some other project. Step 1, knit one row of thin, smooth, crochet thread or ravel cord. 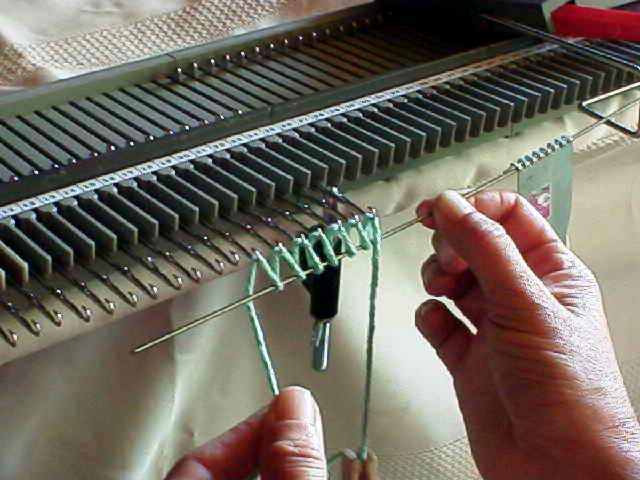 ​Step 2 Run the wire through the row of ravel cord stitches and push the needles forward so that stitches are behind latches. Step 3 Place carriage on other side of bed. Step 4 Lift the knitting off of the bed by holding the wire at either end and turn it around.